“The sweat obstructive effect of the sage is outstanding. Earlier in time the sage was used more often than today. In the twenties of this century people used the sage to make tinctures and pour-ons, In order to control the nightly sweat of people suffering from tuberculosis. Today, this kind of treatment is no longer used; nevertheless the former physicians were very successful with it. The active substance of the sage – possibly mainly its ethereal oil – regulates the secretion of the sweat to a normal stage and also regulates the central nervous system, which is responsible for the control of the sweat glands. This means: they attack the production of the sweat and the central control system at the same time. No wonder is sage one of the most successful sweat hampers. Sage also, is able to control the sweat glands, which is conducted by the pilocapin (pilocapin is used in the ophthalmology for the treatment of the glaucoma, and its side effect is a strong secretion of sweat.) 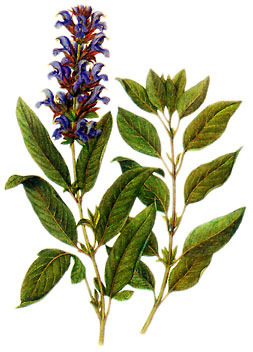 The antihydrotic effect of salvia officinalis are verified by many studies. The reduction of sweat is up to 52%. The effect is between the first and the fourth day, after nine days the effect stops. Especially the extract from the fresh plant are very efficient. The extract from dried plants are not quiet that efficient. The interesting part about sage is: It slows down the sweat secretion, not matter if used internal or external. Therefore a footbath with sage can help when suffering from sweaty feet, whereby, when taking a tincture when suffering from sweat based from nervousness or over weight is effective. In some cases the combination of internal and external use is appropriate. The garden sage reduces the sweat secretion in the following cases: hyperhidrosis, Morbus Basedow, nervousness, neurastheny, sweaty feet, tuberkulose, over weight, and discomfort during manopause"